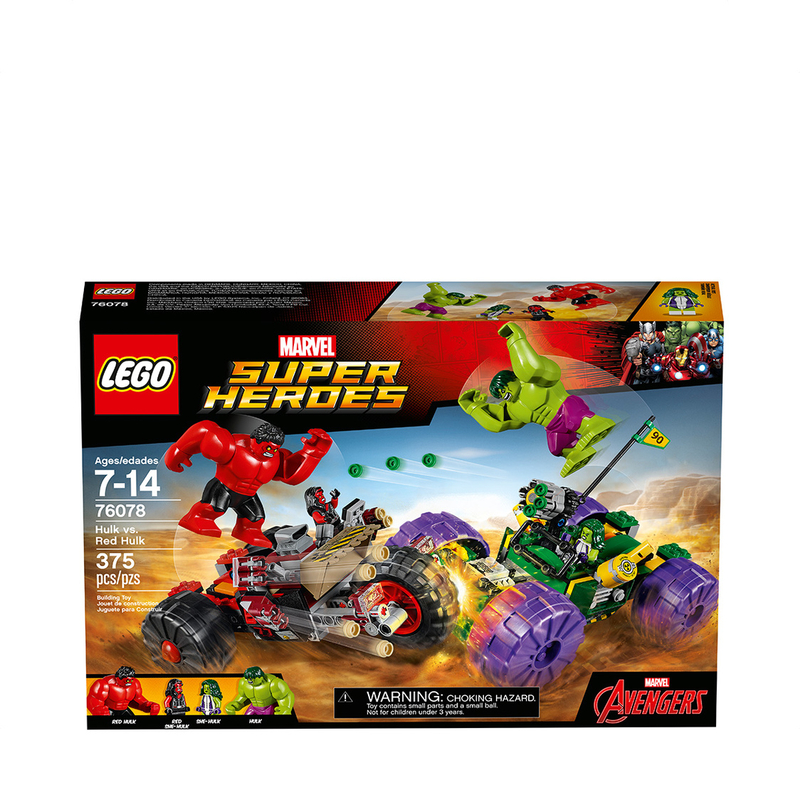 Hulk and She-Hulk are heading for an explosive collision with Red Hulk and Red She-Hulk. Feel the earth shake as the vehicles smash into each other, launching the Hulks into a mid-air battle! Then fire off the green team’s 6-stud shooter and red team's twin-stud shooters as She-Hulk carries on a fierce battle with Red She-Hulk in this ultimate Hulk mash-up! - Includes She-Hulk and Red She-Hulk minifigures, plus Hulk and Red Hulk big figures. - Hulk team vehicle features a jumping Hulk function, 4 large wheels, movable 6-stud shooter, 2 radioactive containers and a pole with flag. - Red Hulk team vehicle features a jumping Hulk function, 3 large wheels and 3 twin-stud shooters. 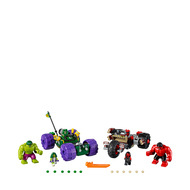 - Smash the vehicles into each other to send the Hulks flying towards each other! - Match the green vehicle's 6-stud shooter against the red vehicle's 3 twin-stud shooters. - This set offers an age-appropriate build and play experience for ages 7-14. - Team Hulk vehicle measures over 5” (14cm) high, 7” (19cm) long and 4” (11cm) wide. - Team Red Hulk vehicle measures over 2” (7cm) high, 7” (19cm) long and 5” (14cm) wide.